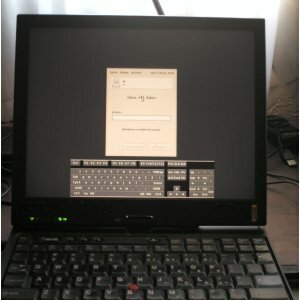 This document describes the process of configuring Linux, Ubuntu 8.04 Hardy (release 2008) on a IBM ThinkPad X41 Tablet, with my scripts and patches to download. To download xorg.conf, for reference. For Fingerprint sensor see How_to_enable_the_fingerprint_reader_with_ThinkFinger and my entry. To try orientation sensor, apt-get install hdapsd hdaps-utils, then use hdaps-gl. Add this to /etc/modprobe.d/options to correct orientation. I have made this script in /usr/local/bin/rotatetablet (it’s is based on a script by Saikat Guha found here). 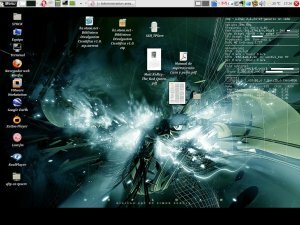 It rotates screen, rotates stylus, changes tablet page down/up keys, and deactivate compiz if active (Because Compiz freezes with xrand )*. Arguments are [left|right|inverted|normal] or empty for next. I use keylaunch (apt-get install keylaunch) to enable tablet buttons. It can be automatically started in Gnome Session programs. First button calls previous rotatetablet script and second one calls cellwriter program for tablets (apt-get install cellwriter) . Add to kernel options vga=0×317 and remove splash. In /etc/modprobe.d/blacklist-framebuffer, comment #blacklist vesafb to enable vesa framebuffer. To activate colors I have done a patch for file /etc/lsb-base-logging.sh. #    echo "[ OK ]"
2. Substitute /etc/acpi/x41tsup.sh and /etc/acpi/x41sdown.sh with these new versions and make sure that they’re executable. …and that should do it. NOTE: /usr/local/bin/rotatetablet needs the ‘compiz –replace’ line uncommented if you use compiz. Los modulos VMWARE no compilan en el Kernel 2.6.24 (No esta aun soportado). El patch oficial vmware-any-any-update115, ftp://platan.vc.cvut.cz/pub/vmware, resuelve problemas con algunos kernels anteriores pero tampoco compila en el 2.6.24. Peter Teoh ha creado el patch no oficial vmware-any-any-update-116.tgz que si compila en 2.6.24 modificando el modulo vmmon.tar, tomando como base el patch 115 anterior. Tras investigar un poco, el problema es que esta funcion solo la soporta el modulo vmnet.tar que viene con el vmware original, que incluye los binarios precompilados smac_linux.x386.o_shipped y smac_linux.x86_64.o_shipped que dan soporte a esta funcion. 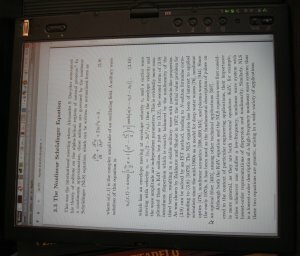 Pero los modulos originales no valen porque no funcionan en el kernel 2.6.24. Tras investigar algo mas, hay una forma de conseguir que el vmware-any-any-update115 soporte esta funcion. En /usr/local/lib/vmware/modules/source/ estan los modulos originales tras instalar vmware. Con esto generamos el nuevo vmnet.tar con soporte Wireless. Y con el vmmon.tar modificado del 116 podemos regenerar el vmware-any-any-update115 con soporte para Kernel 2.6.24 y Wireles Bridge. VMware modules do not compile in the Kernel 2.6.24 (Not even supported). The official patch vmware-any-any-update115, from ftp://platan.vc.cvut.cz/pub/vmware, solves problems with some earlier kernels, but it does not compile in 2.6.24. Peter Teoh has created the unofficial patch vmware-any-any-update-116.tgz that compiles with 2.6.24 modifying the module vmmon.tar, based on the previous 115 patch. After investigating a bit, the problem is this function is only supported in vmnet.tar module that comes with the original vmware, which includes precompiled binaries smac_linux.x386.o_shipped and smac_linux.x86_64.o_shipped which support this function. But the original modules are not worth because they do not compile in the kernel 2.6.24. After investigating something more, there is a way to make the vmware-any-any-update115 support this function. In /usr/local/lib/vmware/modules/source/ are vmware original modules after install. 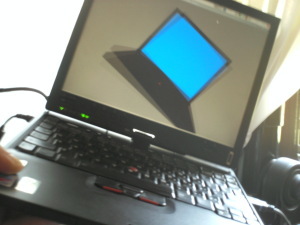 This generates the new vmnet.tar with wireless support. And with modified vmmon.tar from 116 we can regenerate the vmware-any-any-update115 with support for Kernel 2.6.24 and Wireless Bridge.